At an average speed of almost 160 km per hour, the title contenders staged breath taking duels as the standing at the top of the points classification were on a razor's edge going into Monza and remain open with one round still to be contested in just over a fortnight’s time. 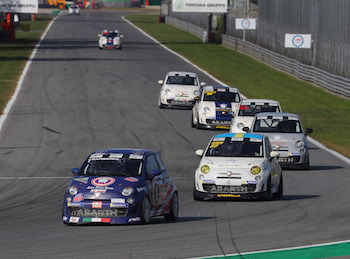 Last weekend Monza hosted the sixth and penultimate round of the “Trofeo Abarth 500” 2018, which is being contested by identical specification versions of the Abarth 695 Assetto Corse Evoluzione and Abarth 500 Assetto Corse across two categories. At an average speed of almost 160 km per hour, the title contenders staged breath taking duels as the standings at the top of the points classification were on a razor's edge going into Monza and remain open with one more round still to be contested; that comes up in just over a fortnight’s time. The first race was won by the Juuso Pajuranta, the title hopeful finishing ahead of Italian Cosimo Barberini, the championship points leader, by a hair's breadth, just 0.149 of a second to be precise, meaning the Finn chipped away slightly at the Italian’s advantage at the top of the standings. Race 2 was won by young Italian driver Andrea Mabellini with Barberini the runner up once again, but with Pajuranta going missing from the big paying points positions Barberini eased out a useful cushion to take into the final round. Thanks to his two well-deserved second places from last weekend’s two races at Monza, Barberini is still leading the overall classification of the Trofeo Abarth 500 with a score of 232 points, comparing very favourably to Pajuranta's 207 points and Mabellini's 202 points. That means the fight for the championship title carries on to the final round of the Trofeo Abarth 500, which is scheduled to be held on 27-28 October at the Mugello Circuit in Tuscany. Once again, in Monza members of the “Scorpionship”, the community dedicated to the Abarth brand and which numbers more than 100,000 members, as well as local Abarth clubs, crowded into the paddock and the Abarth hospitality zone. They enjoyed the unique opportunity to meet the drivers, watch the mechanics preparing the cars, experience the pre-race excitement and enjoy the atmosphere of the legendary Monza paddock. 1. Juuso Pajuranta (FIN) 13 laps in 28'47"116; 2. Cosimo Barberini (ITA) at 0"149; 3. Andrea Mabellini (ITA) at 34"642; 4. Robin Appelqvist (SWE) at 34"946; 5. Stefano Fiamingo (ITA) at 51"915; 6. Biagio Caruso (ITA) at 1'06"109; 7. "Gioga" (ITA) at 1'14"932; 8. Cristian Boninsegna (ITA) at 1'29"755; 9. "Boga" (ITA) at 1'41"727; 10. Filippo Lazzaroni (ITA) at 1 lap (Abarth 500 Assetto Corse); 11. Aurora Coria (ITA) at 1 lap (Abarth 500 Assetto Corse). Fastest lap: Cosimo Barberini in 2'11"291, average speed 158.8 km/h. 1. Andrea Mabellini (ITA) 12 laps in 28'14"680; 2. Cosimo Barberini (ITA) at 1"691; 3. Robin Appelqvist (SWE) at 21"015; 4. Stefano Fiamingo (ITA) at 28"142; 5. Biagio Caruso (ITA) at 37"995; 6. "Gioga" (ITA) at 57"930; 7. "Boga" (ITA) at 1'03"041; 8. Cristian Boninsegna (ITA) at 1'03"985; 9. 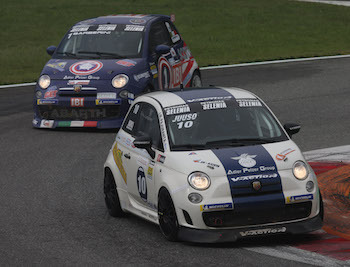 Filippo Lazzaroni (ITA) at 1'37"039 (Abarth 500 Assetto Corse); 10. Aurora Coria (ITA) at 1 lap (Abarth 500 Assetto Corse). Fastest lap: Juuso Pajuranta in 2'11"768, average speed 158.3 km/h. 1. Cosimo Barberini (ITA) 232 points; 2. Juuso Pajuranta (FIN) 207 points; 3. Andrea Mabellini (ITA) 202 points; 4. Robin Appelqvist (SWE) 144 points; 5. Stefano Fiamingo (ITA) 86 points. Italiaspeed provides daily independent news on the Italian auto industry, we keep free from any affiliations to bring you the facts. If you read Italiaspeed and like it please consider supporting us.